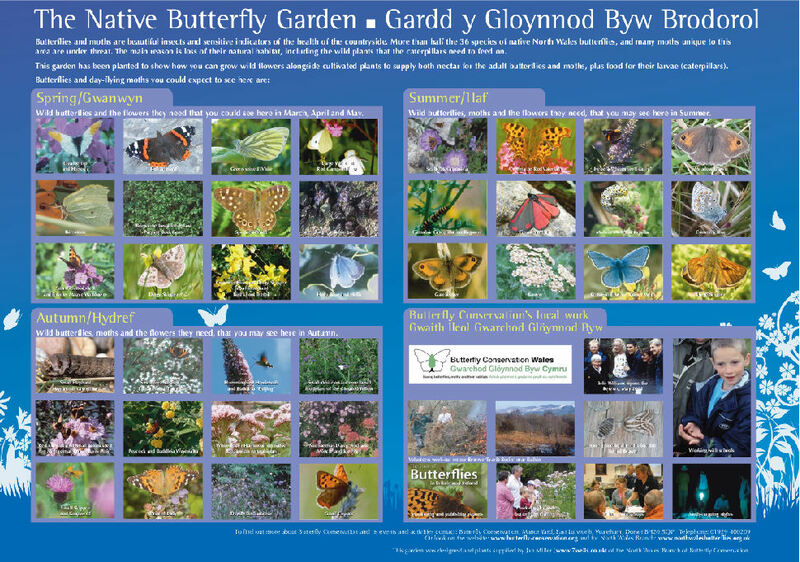 This A1 size panel will help visitors to your native butterfly garden identify the less familiar plants and the butterflies that could be seen on them in Spring, Summer and Autumn. Printed on heavy-guage aluminium sheet, the panels are baked inside a weather-proof, fade-resistant and vandal-resistant resin. They come ready-drilled with screws to fix to your wall, plinth or stand as you wish. You can have your own photos of your volunteers in the bottom right hand panel for an extra £40, and your funders/sponsors' logos added in the bottom left corner. 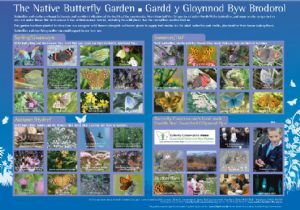 Those customers outside Wales will of course have a slightly edited version that doesn't include Welsh and refers to national UK Butterfly Conservation. In Wales you can have all-Welsh or bilingual. If you'd like to discuss other possiblities and see a higher resolution photograph of the panel, please e-mail us!